As a non-profit, we run solely on volunteer efforts and donations. 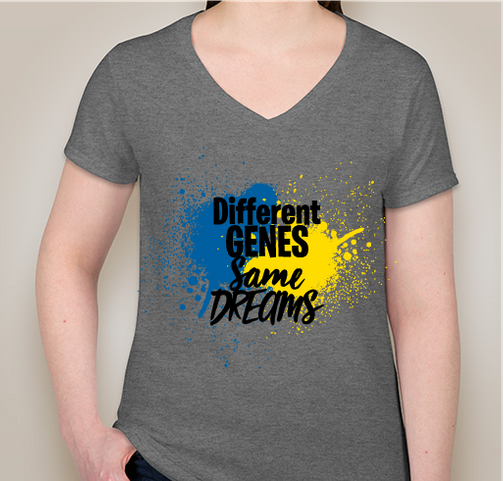 We are excited to offer DSC specific, as well as Ds Awareness merchandise for purchase to help off-set our operating costs and other financial obligations (social gatherings, new parent baskets, scholarships, etc.). We appreciate every purchase and know that 100% of our profits earned from any merchandise sales go directly back into the organization and our community. Thank you for your support! In honor of Down Syndrome Awareness Month 2018, which officially kicks off in October, we are excited to be hosting a fundraiser to benefit our great organization, Down Syndrome Connection. What do we do at DSC and why do we need your support??? We are the heart and soul of the local Down syndrome community here in Anne Arundel County. We are the first to get the call when a new baby with Ds is born and the first to reach out and embrace a new family as they begin their journey into life parenting a child with Ds. We welcome new and expectant families with a beautiful basket full of books, resources, materials, and gifts, all aimed at supporting and celebrating their new baby. Did you know that we’ve welcomed 20 new families in the past 2 years? Funding these baskets (at about $70 each) in an effort to support these new families is an enormous part of our mission. What else does funding do to support our great organization? Funding allows us to provide materials to the greater community that help us in expanding our outreach efforts and aid us in connecting with new families and educating medical providers on how to deliver a Down syndrome diagnosis. Funding allows us to sponsor scholarships so that individuals with Ds and/or their family members may attend Ds specific conferences, camps, workshops, etc. Funding allows us to host social gatherings and educational seminars that bring families together. Funding allows us to become more involved in learning about advocacy initiatives and legislative opportunities affecting individuals with Ds by becoming partnering members with other major Down syndrome organizations throughout the country. At the heart of our mission is connecting individuals with Down syndrome and their families to supports within the community while promoting a culture of inclusion, advocacy, education, and family support, all aimed at improving the lives of those living with Down syndrome. We are so grateful for your support and please know that every single penny and donation make an enormous difference in the lives of those with Down syndrome - and their families - within our local community. Again, we want to thank each and every one of you for your generous support! Please share this fundraiser far and wide - shirts can be shipped anywhere within the continental United States!